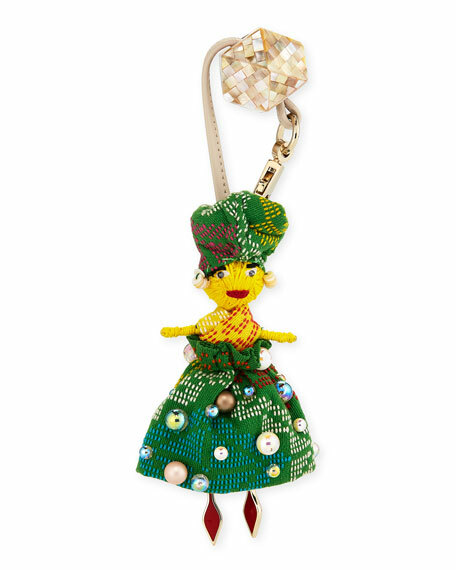 Christian Louboutin fabric manila doll charm for handbag with multicolor ball studs. Leather top with textile feature; lobster class closure. Signature red soles create feet of doll. Please note: Color and design of dolls will vary. Edie Parker pearlescent cherries charm for handbag. In signature hand-poured acrylic; glittered reverse. Hanging engraved-logo tag. Silvertone lobster clasp. Approx. Edie Parker pearlescent cherries charm for handbag. In signature hand-poured acrylic; glittered reverse. Hanging engraved-logo tag. Silvertone lobster clasp. Approx. 3"H x 2.8"W x 0.4"D. Handmade in USA. Fendi monster charm in dyed fox (Finland) and dyed rabbit (Spain) furs. Approx. 9.8"L x 7.2"H x 1.5"D. Silvertone key ring/clip. Leather/brass/ethylene vinyl acetate. Made in Italy. Fendi space monkey charm with dyed mink (Denmark) and dyed fox (Finland) furs. Approx. 7.5"L x 5.2"H x 1.5"D. Silvertone logo key ring/clip. Leather/faux leather/nylon/ABS. Made in Italy. Fendi calf leather guitar-style shoulder strap. Hypnogarden motif made up of flowers, leaves, and multicolored optical patterns. Can be used as a shoulder strap for a variety of handbags (sold separately). Approx. 35.4"L x 1.6"W. Palladium lobster clasp ends. "Strap You" is made in Italy.